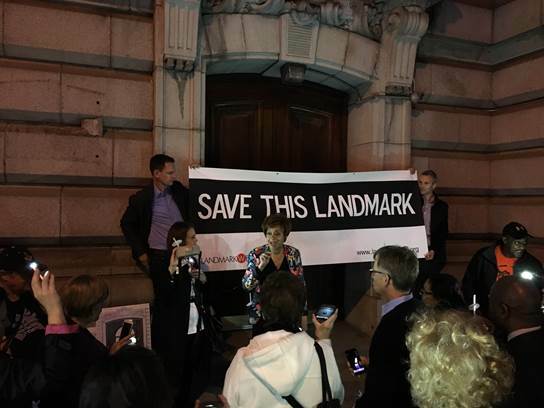 More than 100 New Yorkers held a candlelight vigil in front of the former First Church of Christ, Scientist at 96th Street and Central Park West to bring awareness to threats facing this Individual Landmark designed by Carrère and Hastings, the same architects who gave us the New York Public Library main branch. On June 2, 2016, in a session beginning at 10:00am at 22 Reade Street (please mark your calendar and plan to attend! 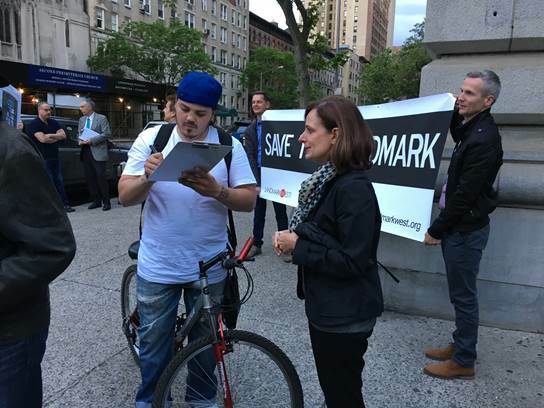 ), the Board of Standards & Appeals is scheduled to vote on proposed zoning variances that would allow developers to pack 34 luxury condominiums – the equivalent of a residential high-rise – into the interior, with penthouses on the roof. Original stained glass attributed to important 19th-century artists will be removed. New windows will be carved into the facade, most extensively on the facade directly facing neighbors’ existing windows, less than 10 feet away in some cases. This building saved my life…This in not just brick and mortar. 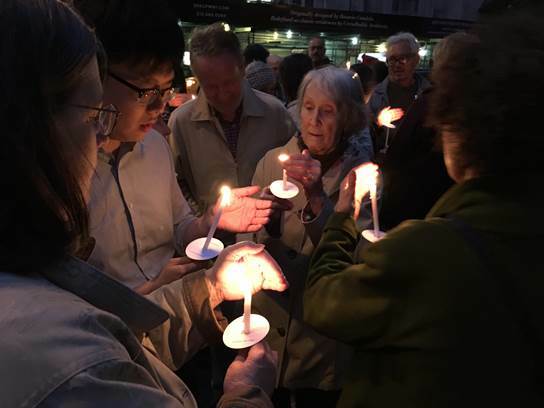 Scroll down for photos of the vigil, also check out the CPW Neighbor’s Association Facebook Page and more information about this issue on the LW! Watch-Blog. 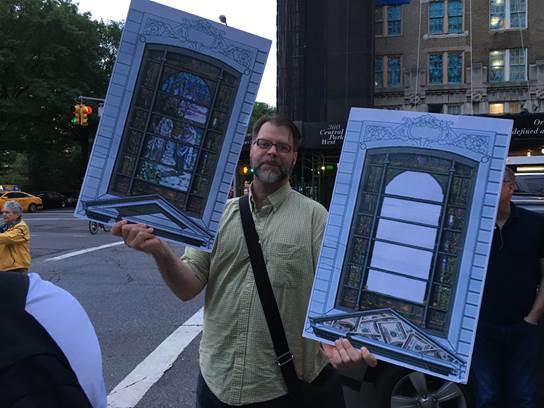 Dale vander Sande holds boards of the existing mission window (left) and a parody (right) with the “religious iconography” removed. 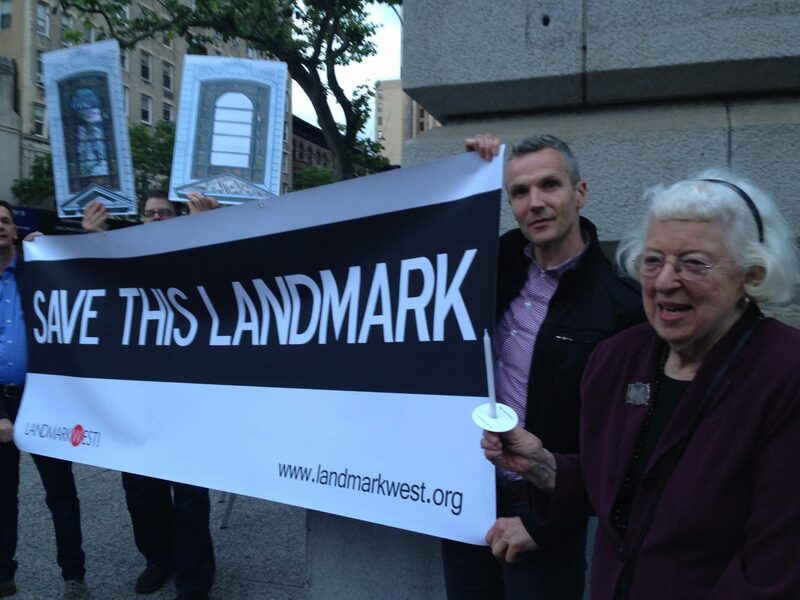 Former congregant Gabrielle Everett discusses what the individual landmark means to her. 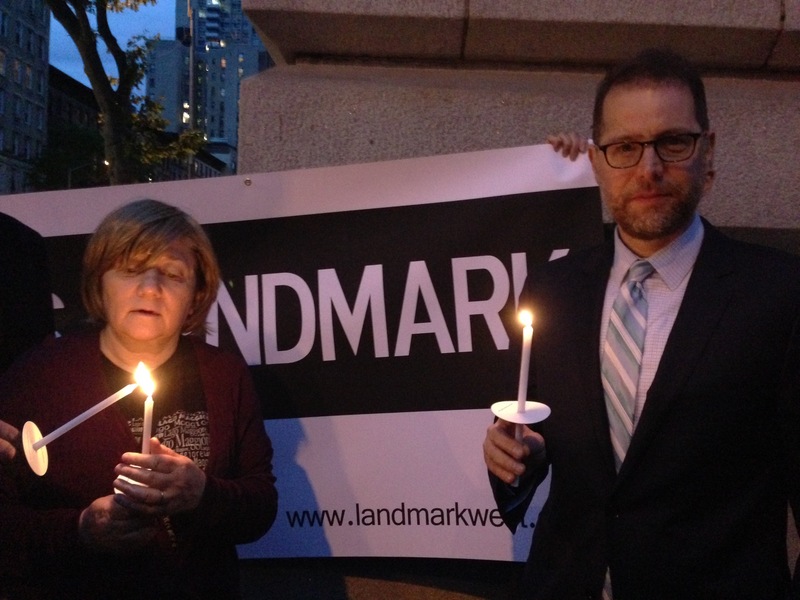 Manhattan Borough President Gale Brewer’s Land Use liaison to the Upper West Side Community Board 7 lights a candle in solidarity with neighbors for 361 Central Park West.